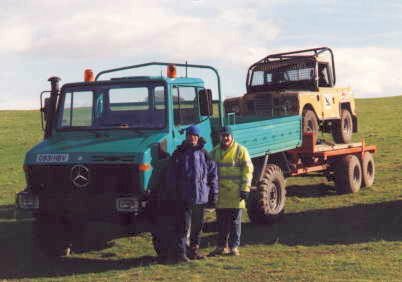 This page shows some of our past work using Mercedes Unimog 4x4 trucks. 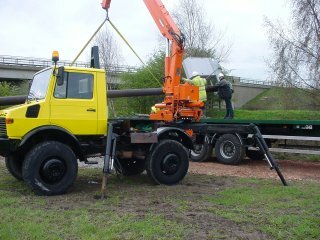 April 2004 – This was our latest Unimog U1500 with an Atlas 10.5 ton/metre crane. 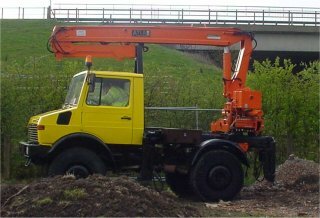 It's one of the largest cranes that can be fitted to a Unimog and makes a very impressive all terrain crane. 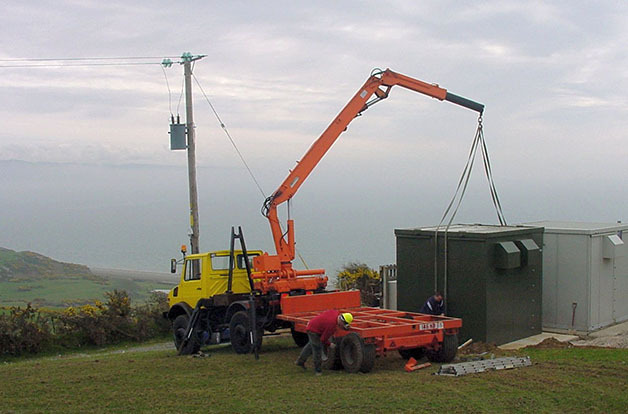 The Unimog U1500 at work lifting a 15m telegraph pole style mast weighing 1400 kg off the road transport. 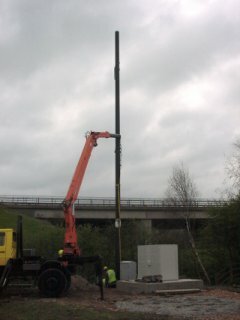 The 15m mast lifted into position. 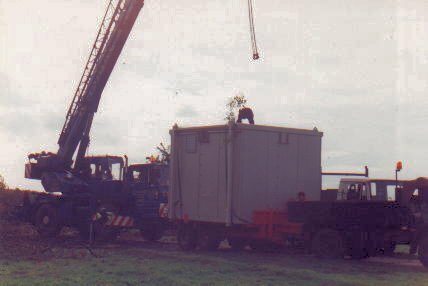 The U1500 on another job, this time lifting a mobile phone equipment cabin off the trailer after travelling over undulating terrain to site. This site is near Criccieth, Gwynedd in North Wales and is located overlooking the Irish Sea. 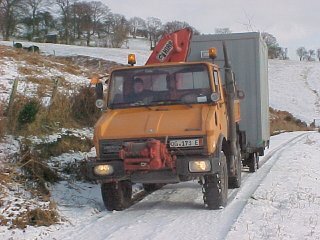 February 2003 - This was our Unimog U1000 with Hiab crane and Werner winch in the snow delivering an equipment cabin to a hill top radio site near Newtown / Y Drenewydd in Mid Wales. A real all weather delivery service!! 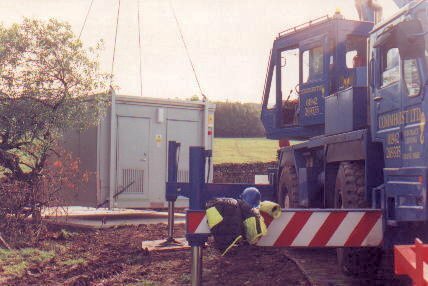 The equipment cabin was accurately positioned on site with the HIAB crane. 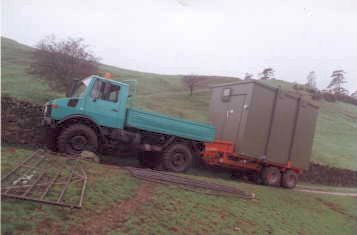 Back in 1996 our Mercedes Benz Unimog S404 delivered a cell phone equipment cabin at Kirkby Stephen, Cumbria, England. 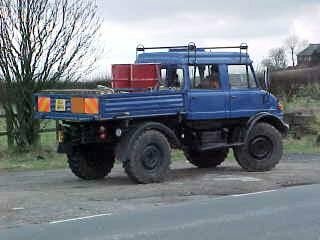 For the Unimog enthusiast, the S404 was fitted with a 3000cc diesel engine from a MB 300D in place of the original petrol engine. The gradient of the hill was 1 in 6; the cabin and trailer combination weigh 4500 kg. 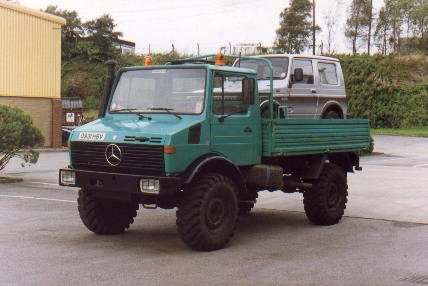 The Unimog was fitted with 14.5 x 20 tyres for additional traction on soft surfaces. 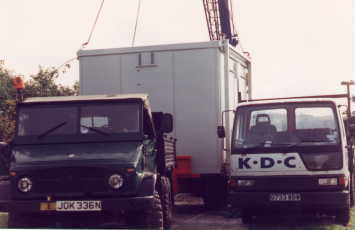 A view of the Unimog S404 and cell phone equipment cabin on the road. 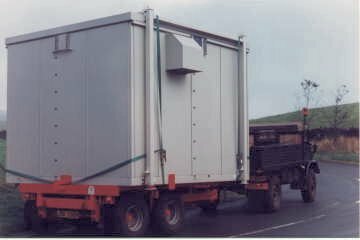 A rear view of the cell phone cabin on the trailer. 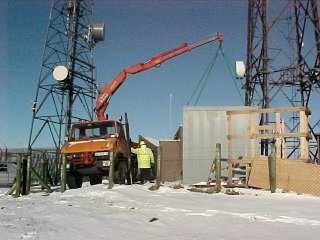 The cell phone equipment cabin being lifted from the trailer by a Commhoist crane. Another view of the cabin and trailer. The cabin is nearly in place. 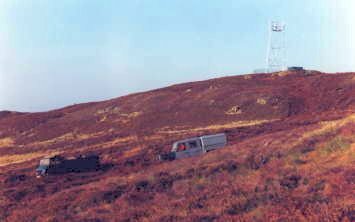 In 1996 we were contracted by a UK cell phone operator to provide site access across peat moorland at Auchencrosh Hill near Stranraer, Scotland. 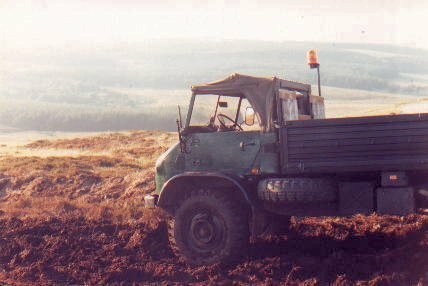 The Unimog was the ideal vehicle for the job. Few vehicles can travel on a motorway at 50 mph (80 km/h) and still work on such soft terrain. 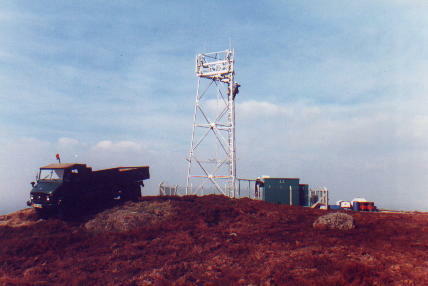 The tower was air-lifted in by helicopter. Another view of Auchencrosh Hill. Access was across very soft peat moorland. Access "track" to Auchencrosh Hill over typical Scottish heather. 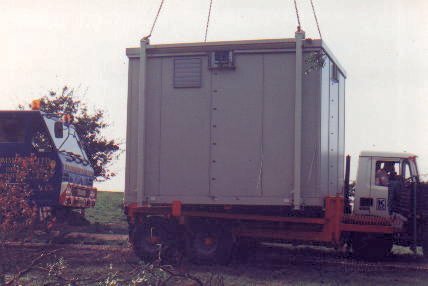 In 1998 our Mercedes Unimog U1300L was towing another cell phone equipment cabin to a site in Cumbria, England. 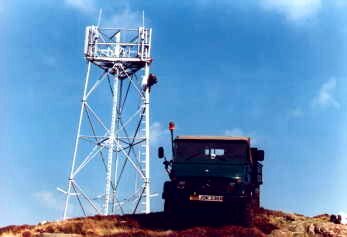 In 2000 our Mercedes Unimog U1100 crewcab was equipped at considerable expense to deploy mobile cell sites for Dolphin Telecom. 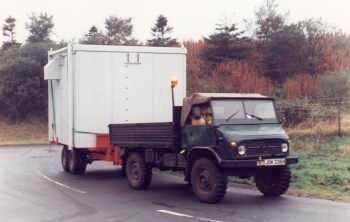 In addition to standard Unimog features it was equipped with a dual 12 / 24 V trailer electrical system gas oil tanks with a distribution pump for generator re-fueling and dry storage for specialist equipment. It's not all work on this website!! 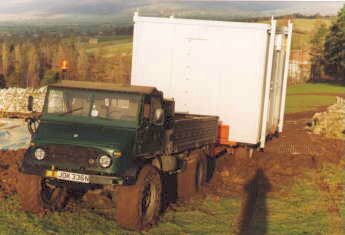 We delivered our Land Rover Series 3 trials motor to the Easter 1998 event at Greystoke, Cumbria with the Unimog U1300L and trailer. Pity we couldn't tow it around the trials course!! Q. 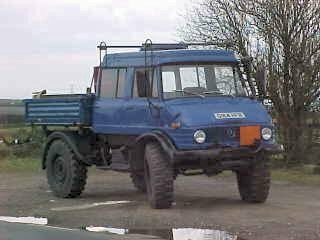 How can a Suzuki jeep go where a Unimog can go?